This discography covers pre- and post-Creedence releases. It will give you an impression of it's cover, tracklist and singles released. If a single is mentioned seperately in this list, it's a non-album single and thus a unique release. 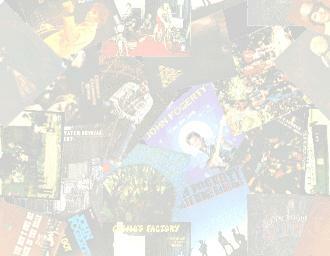 Click on selected album titles marked with to read a review or additional information. If you have anything to contribute to this page, please tell me so I can put it in. Tracks: 1- I Put A Spell On You, 2- The Working Man, 3- Suzie Q, 4- Ninety-Nine And A Half, 5- Get Down Woman, 6- Porterville, 7- Gloomy, 8- Walk On The Water. Singles: Suzie Q (parts 1 and 2), I Put A Spell On You/Walk On The Water. Tracks: 1- Born On The Bayou, 2- Bootleg, 3- Graveyard Train, 4- Good Golly Miss Molly, 5- Penthouse Pauper, 6- Proud Mary, 7- Keep On Chooglin'. Singles: Proud Mary/Born On The Bayou, Bootleg/Good Golly Miss Molly (France only). Tracks: 1- Green River, 2- Commotion, 3- Tombstone Shadow, 4- Wrote A Song For Everyone, 5- Bad Moon Rising, 6- Lodi, 7- Cross-Tie Walker, 8- Sinister Purpose, 9- The Night Time Is The Right Time. Singles: Bad Moon Rising/Lodi, Green River/Commotion. Tracks: 1- Down On The Corner, 2- It Came Out Of The Sky, 3- Cotton Fields, 4- Poorboy Shuffle, 5- Feelin' Blue, 6- Fortunate Son, 7- Don't Look Now, 8- The Midnight Special, 9- Side O' The Road, 10- Effigy. Singles: Down On The Corner/Fortunate Son. Tracks: 1- Ramble Tamble, 2- Before You Accuse Me, 3- Travelin' Band, 4- Ooby Dooby, 5- Lookin' Out My Back Door, 6- Run Through The Jungle, 7- Up Around The Bend, 8- My Baby Left Me, 9- Who'll Stop The Rain, 10- I Heard It Though The Grapevine, 11- Long As I Can See The Light. Singles: Travelin' Band/Who'll Stop The Rain, Up Around The Bend/Run Through The Jungle, Lookin' Out My Back Door/Long As I Can See The Light. Tracks: 1- Pagan Baby, 2- Sailor's Lament, 3- Chameleon, 4- Have You Ever Seen The Rain, 5- (Wish I Could) Hideaway, 6- Born To Move, 7- Hey Tonight, 8- It's Just A Thought, 9- Molina, 10- Rude Awakening #2. Singles: Have You Ever Seen The Rain/Hey Tonight, Molina/Sailors' Lament (Germany only). Tracks: 1- Lookin' For A Reason, 2- Take It Like A Friend, 3- Need Someone To Hold, 4- Tearin' Up The Country, 5- Someday Never Comes, 6- What Are You Gonna Do, 7- Sail Away, 8- Hello Mary Lou, 9- Door To Door, 10- Sweet Hitch-Hiker. Singles: Sweet Hitch-Hiker/Door To Door, Someday Never Comes/Tearin' Up The Country. Tracks: 1- The Legend Of Alcatraz, 2- Lady Of Fatima, 3- Beauty Is Under The Skin, 4- Wondering, 5- My Pretty Baby, 6- Train To Nowhere, 7- Everyman, 8- The Me Song, 9- Cast The First Stone, 10- Here Stands The Clown. Singles: Goodbye Media Man Part 1/Part 2, Cast The First Stone/Lady Of Fatima. Tracks: 1- Latin Music, 2- Regret It (For the Rest of Your Life), 3- Guitars, Drums & Girls, 4- I'm A Man, 5- She's About A Mover, 6- I Just Want To Cry, 7- Get Your Raise, 8- Daydream, 9- Take A Train, 10- Death Machine, 11- Swingin' In A Hammock. Singles: Latin Music/Take A Train. Tracks: 1- Forty Years, 2- Black Jack Jenny, 3- Rocky Road Blues, 4- Faces, Places, People, 5-Get Funky, 6- Sick And Tired, 7- Sign Of The Devil, 8- Straight And Narrow, 9- Next In Line, 10- Annie Mae. Tracks: 1- Blue Ridge Moutain Blues, 2- Somewhere Listening (For My Name), 3- You're The Reason, 4- Jambalaya (On The Bayou), 5- She Thinks I Still Care, 6- California Blues (Blue Yodel #4), 7- Workin' On A Building, 8- Please Help Me, I'm Falling, 9- Have Thine Own Way, Lord, 10- I Ain't Never, 11- Hearts Of Stone, 12- Today I Started Loving You Again. Singles: Jambalaya/Workin' On A Building, Hearts Of Stone/Somewhere Listening. Blue Ridge Rangers non-album single. Tracks: 1- Born On The Bayou, 2- Green River (medley pt.1), 3- Suzie Q (medley pt.2) 4- It Came Out Of The Sky, 5- Travelin' Band, 6- Fortunate Son, 7- Commotion, 8- Lodi, 9- Bad Moon Rising, 10- Proud Mary, 11- Up Around The Bend, 12- Hey Tonight, 13- Keep On Chooglin'. Tracks: 1- It's Been A Good Day, 2- Can You Feel It, Ras?, 3- Mystic Isle Avalon, 4- Reggie, 5- Money (Root The Root), 6- Hot Buttered Rum, 7- Joyfull Resurrection, 8- Heartbeat, 9- Fate, 10- Goin' Back To Okeefenokee. Singles: Joyfull Resurrection/Heartbeat, Mysic Isle Avalon/Reggie, Money/It's Been A Good Day. Tracks: 1- Don't Tell Me Lies, 2- Little Girl (Does You Mama Know), 3- Where You Been, 4- You Came Walking, 5- You Can't Be True, 6- Brown Eyed Girl, 7- You Got Nothin' On Me, 8- You Better Be Careful, 9- Fight Fire, 10- Fragile Child, 10- Porterville, 12- Walking On The Water, 13- You Better Get It Before It Gets You, 14- Call It Pretending. Singles: None. But the entire album is a compilation of pre-CCR singles. Tracks: 1- Rockin' All Over The World, 2- You Rascal You, 3- The Wall, 4- Travelin' High, 5- Lonely Teardrops, 6- Almost Saturday Night, 7- Where The River Flows, 8- Sea Cruise, 9- Dream Song, 10- Flying Away. Singles: Rockin' All Over The World/The Wall, Almost Saturdaynight/Sea Cruise. Tracks: 1-Give Me Another Trojan Song, 2- What Did I Know, 3- Theme From 4-D, 4- Sweet Things To Come, 5- What About Tomorrow, 6- She La La La, 7- And I Love You, 8- Get Up, 9- There Was A Time, 10- Showdown. John Fogerty non-album single. It is actually from the unreleased Hoodoo album. Tracks: 1- Sixteen Tons, 2- Who I Really Am, 3- Rock 'n' Roll Records, 4- Fame And Fortune, 5- Sometimes Loving You, 6- Romance, 7- Sweetwater William, 8- Ballroom Dancing Girl, 9- A Bit Of Love, 10- Living Another Day. Singles: Sixteen Tons/Who I Really Am. Tracks: 1- Red Hot (Ready To Go), 2- Jaime, 3-This 'Ol Guitar, 4- Rock 'n' Roll Lady, 5- My Heart, 6- In The Rain, 7- Baby, Don't Change Your Mind, 8- Love Came Down, 9- Takin' My Time, 10- Round And Round. Tracks: 1- Run with your love, 2- Mistreater, 3- Take a little more Time, 4- Make love to You, 5- Evergreen in Mexico, 6- It's gotta be you, 7- Take me higher, 8- Singin' the blues (reggae), 9- King Arthur's march, 10- Dance All Night. Tracks: 1- Born On The Bayou, 2- Green River, 3- Tombstone Shadow, 4- Don't Look Now, 5- Travelin' Band, 6- Who'll Stop The Rain, 7- Bad Moon Rising, 8- Proud Mary, 9- Fortunate Son, 10- Commotion, 11- The Midnight Special, 12- The Night Time Is The Right Time, 13- Down On The Corner, 14- Keep On Chooglin'. Tracks: 1- Champagne Love, 2- Why Me, 3- Real Real Gone, 4- Tricia Suzanne, 5- Mystery Train, 6- Deal It Out, 7- Open The Window, 8- You Move Me, 9- The Secret, 10- Summer Night. Tracks:1- The Old Man Down The Road, 2- Rock And Roll Girls, 3- Big Train (From Memphis), 4- I Saw It On T.V., 5- Mr.Greed, 6- Searchlight, 7- Centerfield, 8- I Can't Help Myself, 9- Zanz Kant Danz. Singles: The Old Man Down The Road/Big Train (From Memphis), Rock And Roll Girls/Centerfield. Tracks: 1- Running back to me, 2- Life is but a dream, 3- Mistreater, 4- Run with your love, 5- BART, 6- Take me back to London, 7- Can you really say, 8- Singin' the blues, 9- Dance all night. Tracks: 1-Goin' Back Home, 2- Eye Of The Zombie, 3- Headlines, 4- Knockin' On Your Door, 5- Change In The Weather, 6- Violence Is Golden, 7- Wasn't That A Woman, 8- Soda Pop, 9- Sail Away. Singles: Eye Of The Zombie/I Confess, Change In The Weather/My Toot Toot, Sail Away/I Found A Love (Germany only). Tracks: 1- Rainbow Carousel, 2- Money Buys It (Funky Side Of Town), 3- Video Girl, 4- Woman Of The Year, 5- Clearwater Rain, 6- Teardrops, 7- We've Been Here Before, 8- Sometimes, 9- Sloop John B, 10- Unbearable Lightness Of Being. Tracks: 1- Brown-eyed Girl, 2- You Better Be Carefull, 3-Boots, 4- Stop Calling Me, 5- She's Gone, 6- Time, 7- Hole In The Wall, 8- It's Up To You, 9- Made You Cry, 10- Fight Fire, 11- Fragile Child, 12- Losin' You, 13- Yes I'm Crying, 14- I Know You Name Girl, 15- I Never Really Knew, 16- Gotta Get Away, 17- Blow My Mind, 18- Far And Away, 19- Walkin' On The Water, 20- You Better Get It Before It Gets You, 21- Weatherman, 22- Read All About It, 23- Anyhow Anywhere, 24- It Must Be Love, 25- Rat Race, 26- People Through My Glasses, 27- Call It Pretending. Info:1, 2, 10, 11, 19, 20 and 27 are Golliwogs recordings. Tracks: 1- Born on the Bayou, 2- Green River, 3- Suzie Q., 4- I Put A Spell On You, 5- Who'll Stop The Rain?, 6- Premonition, 7- Almost Saturday Night, 8- Rockin' All Over The World, 9- Joy Of My Life, 10- Down On The Corner, 11- Centerfield, 12- Swamp River Days, 13- Hot Rod Heart, 14- The Old Man Down The Road, 15- Bad Moon Rising, 16- Fortunate Son, 17- Proud Mary, 18- Travelin' Band. Tracks: CD1: 1- Born on the Bayou, 2- Green River, 3- Lodi, 4- Commotion, 5- Who'll Stop The Rain, 6- Suzie Q., 7- Hey tonight, 8- Long As I Can See The Light, 9- Down On The Corner, 10- Lookin' Out My Back Door, 11- Cotton Fields, 12- Tomstone Shadow, CD2: 1- I Heard It Through The Grapevine, 2- Midnight Special, 3- Bad Moon Rising, 4- Proud Mary, 5- I Put A Spell On You, 6- Fortunate Son, 7- Have You Ever Seen The Rain?, 7- Travelin' Bamd, 8- Run Through The Jungle, 9- Up Around The Bend.